GOAL: To Build four Counties, thirteen Towns of Long Island by means of hands-on collaboration with young people working cooperatively and making a difference. 6. Encourage following the Rules. Signal to begin. 1. Who initiated the activity? 2. Who were the leaders? 3. How were limits of 'the problem' defined? 4. Who provided 'the last piece'? 5. Did the border and corner pieces appear right away or later? 6. Was the task completed inside-out or outside-in? 7. Was the 'Legend' finished before geographic areas were finished? 8. Was anyone unable to contribute? 9. Did you observe any conflicts resolved? Which ones? How? 10. What was the pattern of cooperation you observed? 11. How could the whole process be improved upon the next time? 12. What other lessons might be learned from this activity? Metaphors are methods of perception that help us see the world in different ways. More than one definition exists for most nouns. Maps are puzzles. Maps are games. Map puzzles challenge people whether or not the GOAL is expressed or defined. A map puzzle is an educational manipulative heightening awareness of spatial relationships. They are icebreakers and team builders and more than the sum of their parts. 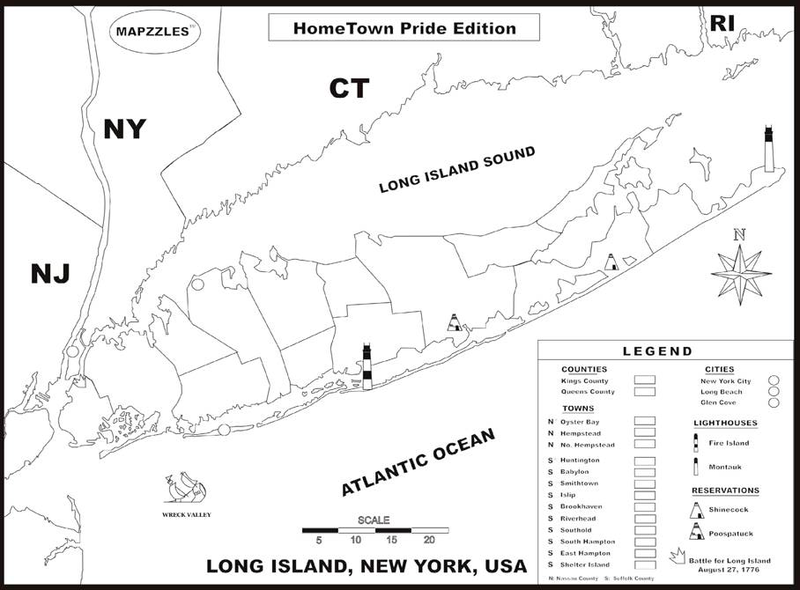 Invite your members to share their thoughts as they were putting Long Island together. Think of your class as a jigsaw metaphor and each piece (student) important as part and parcel in the completion of your Big Picture. Each piece may be different but each one has a specific space to fill. The class and Big Picture remains unfinished till each student makes their contribution of those pieces of themselves they wish to share in order to build the project, literally, at hand. Nothing's missing and nothing's extra. We have all that we need to succeed - in the present. Success is what happens when people work together toward achieving a common GOAL. 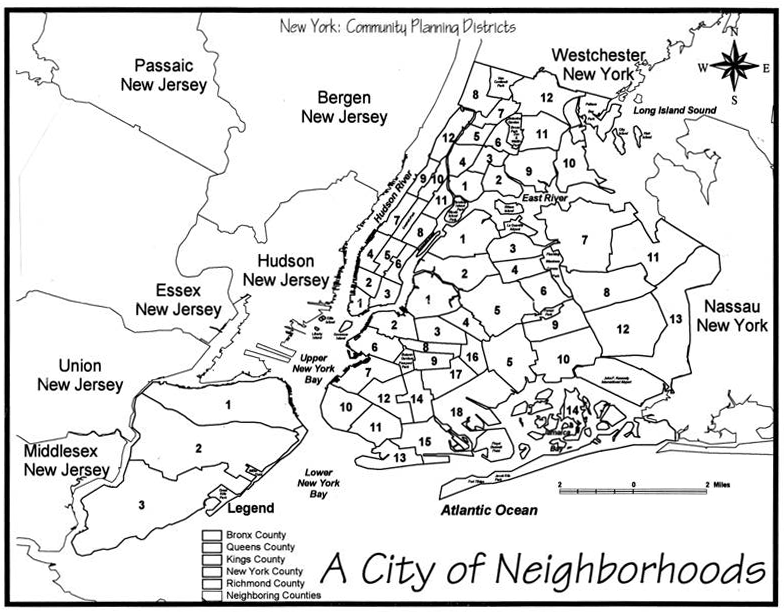 Assemble a panorama of New York City Community Districts by collaborative means while engaging in non-verbal activity. 6. Begin. Encourage participants to follow the RULES. 3. How were boundaries defined? 7. Were areas of text finished before local areas were completed? 9. Did you observe any conflicts being re-solved? Which ones? How? 10. Assemble one Borough at a time -- green, white, yellow etc. Metaphors are methods of perception that help us see the world in different ways as being one thing or another. There are multiple definitions for anything. Mapzzles® are maps that are puzzles. Mapzzles® are games too. Mapzzles® are virtual problems needing to be solved whether the mission is virtual or visual or vaguely undefined. Mapzzles® are icebreakers as well as team builders. Mapzzles™ are Meta-Fours© - More than the sum of their parts. And so are you! How do I know? How do any of us know what we know? Only four ways. We believe. We think. We feel. We do. We carry that FIRE (spirit) of place within us and wherever we are and wherever we go we hold the FIRE within - Faith, Intuition, Reason and Experience teach us all we know - and we are lifelong learners all. But what kind of learner are you and how do you know that? Are you:a sponge? a funnel? a strainer? a sieve? Bring this to your group and invite a discussion of the meaning of each preceding metaphor.